By Mohammad Jeprie in Gadgets. Updated on November 13, 2017 . 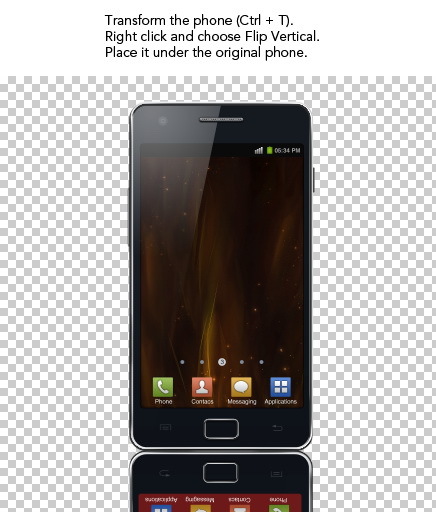 In this tutorial, we are going to draw the famous Samsung Galaxy in Photoshop and Illustrator. We will start by drawing its wireframe in Illustrator and then exporting it to Photoshop to add some sophisticated lighting and other effects. Open up your Adobe Illustrator. Make a new file in A4 size. Hit Ctrl + R to bring up the ruler. Make a new layer and name it guide. We will use this to place all our guides. 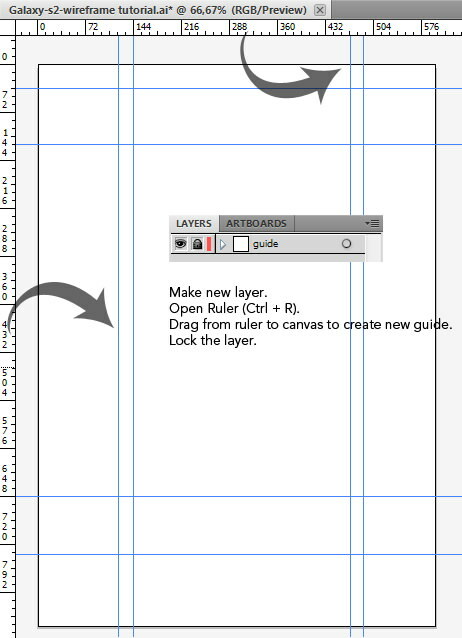 Draw from the ruler onto the canvas to create a new guide. These guides are needed to help us draw the phone wireframe precisely. See the picture below for reference. 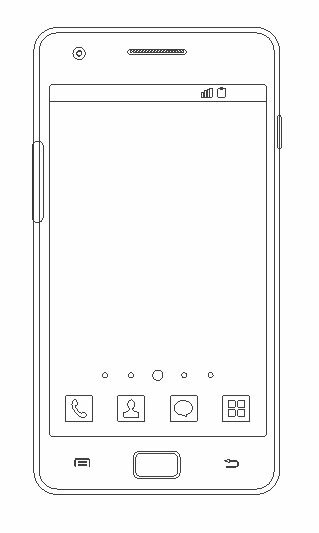 Our first step is to draw a basic phone shape. Activate the Rounded Rectangle tool. 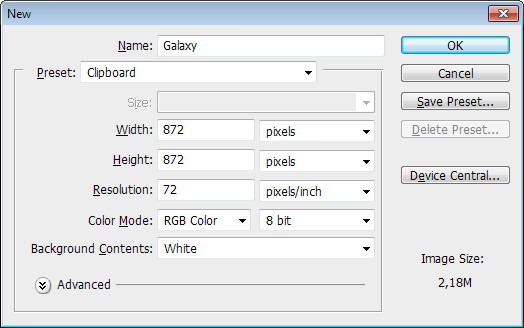 Click once on the canvas to open the Rounded Rectangle option dialog box. Don’t worry with the width and height settings. Make sure to enter 35 pt on Corner Radius. Click OK. You will have a new rounded rectangle shape. You can simply delete it right away because we don’t need it, we just need to change the tool settings. Make sure to activate Smart Guides from the View menu. This feature helps us to snap objects easily onto guides. 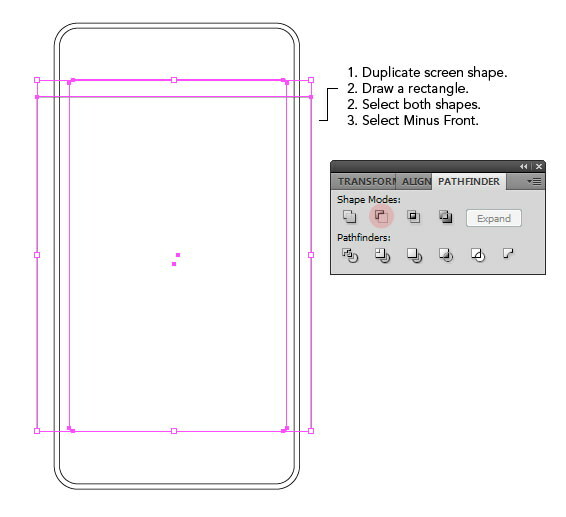 Click and drag to draw a rounded rectangle right inside the provided guide. See the picture below to get its placement. 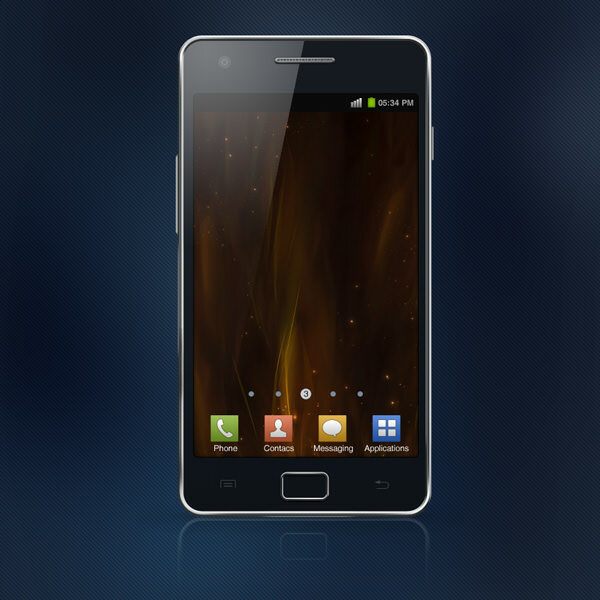 Select the rounded rectangle we have just created. 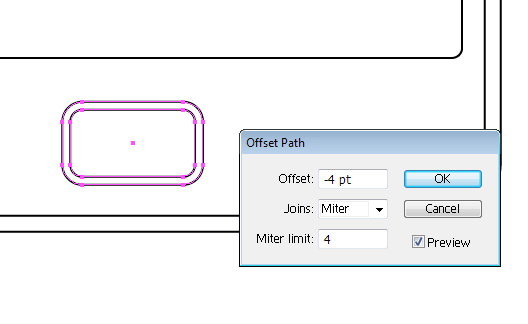 Click Object > Path > Offset Path. Set Offset to -9 pt.  While the Rounded Rectangle tool is still active, click once on the canvas. Set Corner Radius to 5 pt. Delete the rounded rectangle made from the dialog box because we won’t need it. 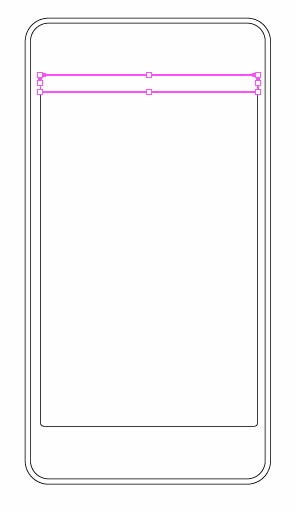 Draw a rounded rectangle inside the screen area. Use the guide to help you draw it precisely. 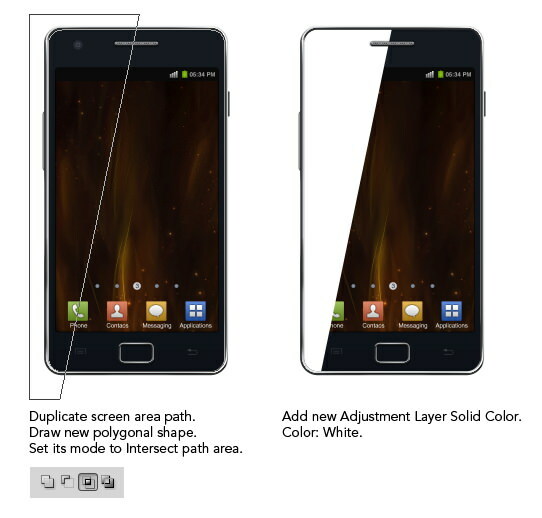 Duplicate screen shape that was just created. 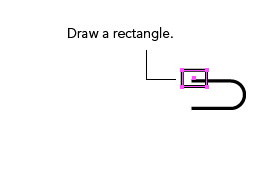 Draw a rectangle under the shape. 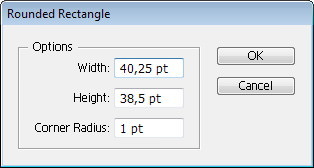 Select both shapes and then select Minus Front in the Pathfinder panel. 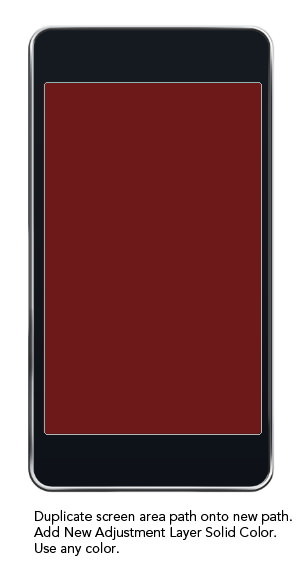 The rectangle will cut the screen area and turn it into half rounded rectangle that we can use as the Status Bar area. Activate Rounded Rectangle tool again and click once on the canvas. Set Corner Radius to 10. 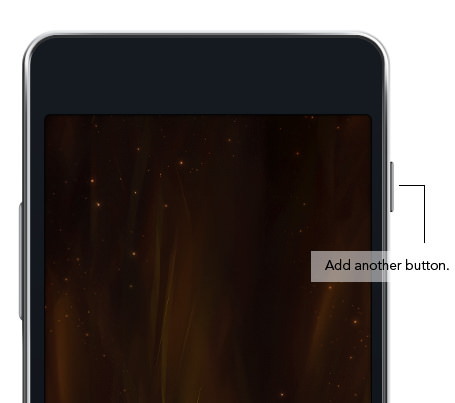 Draw a rounded rectangle on the lower part of the phone; this will be the Home button. Click Object > Path > Offset Path. 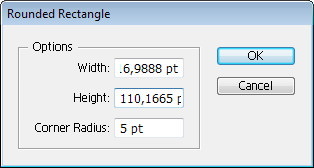 Set Offset to -4 pt. 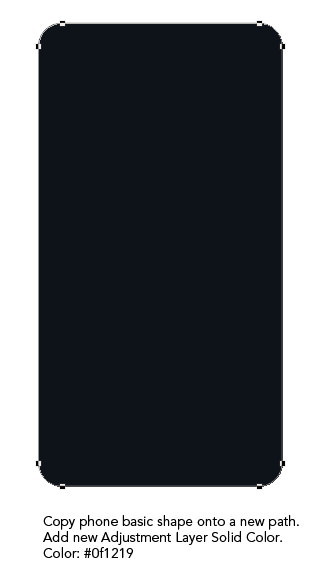 Draw a rounded rectangle and set its Fill to None and Stroke to Black. Draw a rectangle covering its lower part. 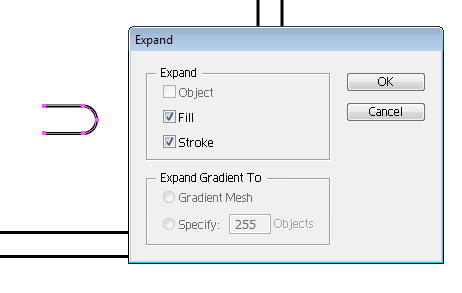 Select both shapes and select Minus Front in the Pathfinder panel. 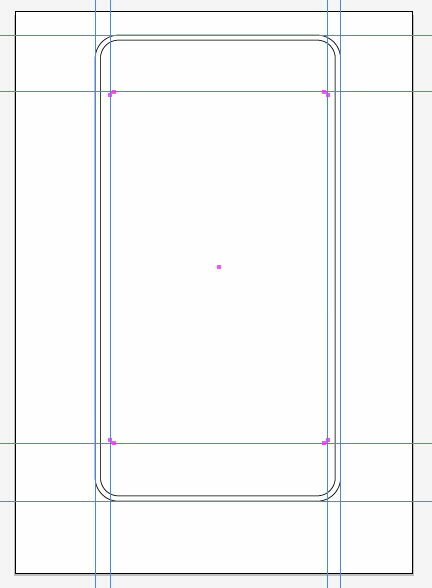 This will cut the lower half of the rounded rectangle and turn it into a half rounded rectangle. Use the Direct Selection tool and select its lower line. Hit Delete to delete it. 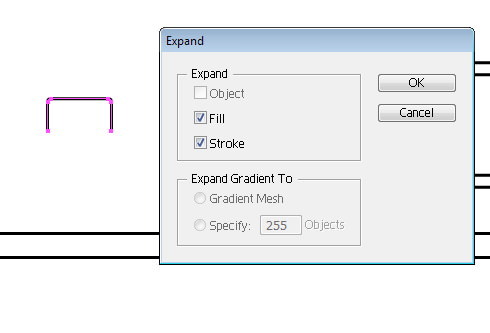 While the shape is still selected, select Object > Expand. This will turn it into a fill shape, not just a line. Draw two small rectangles inside the shape. 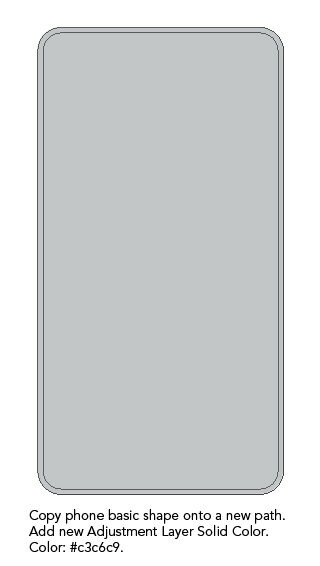 Draw a rounded rectangle and then cover its left side with a rectangle like shown. 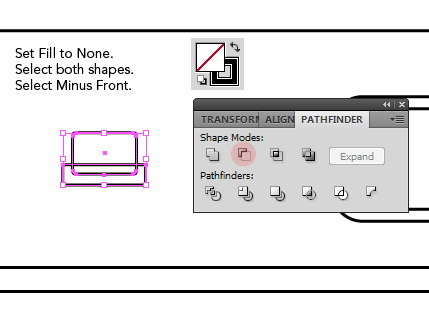 Select both shapes and select Minus Front from the Pathfinder panel. 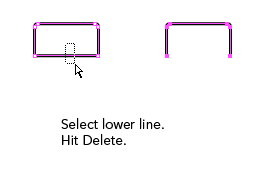 Use the Direct Selection tool to select its left side and then hit Delete. Select Object > Expand to convert this line into a shape. Draw a rectangle on the tip of the shape. Click the center of the left border of the rectangle to add a new point. Click the top and bottom corners to delete. We will get a triangle. 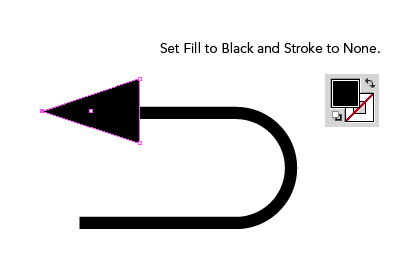 Set Fill to Black and Stroke to None. 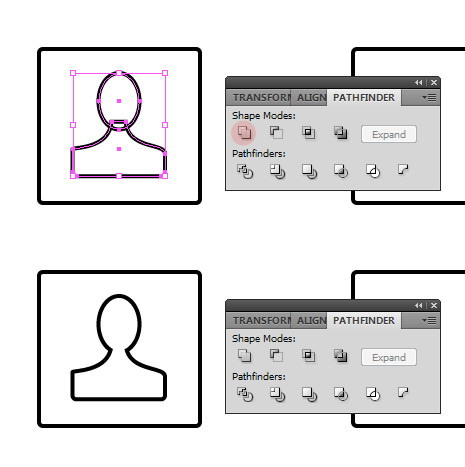 Select both shapes and click Unite on the Pathfinder Panel. Below are the buttons we have made. Activate Rounded Rectangle tool. Click once on the canvas and set Corner Radius to 1 pt. 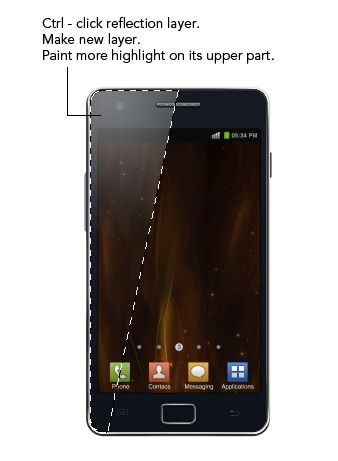 Draw a rounded rectangle inside the screen for the icon base. 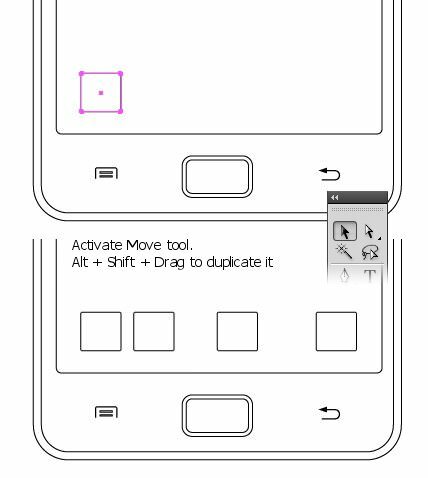 Activate Move tool and Alt + Shift + Drag the shape to duplicate it. 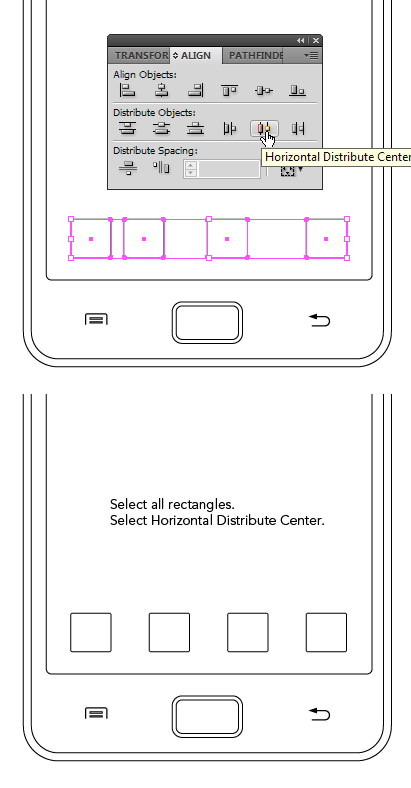 Select the rounded rectangles we have just created and the click Horizontal Distribute Center on the Align panel. 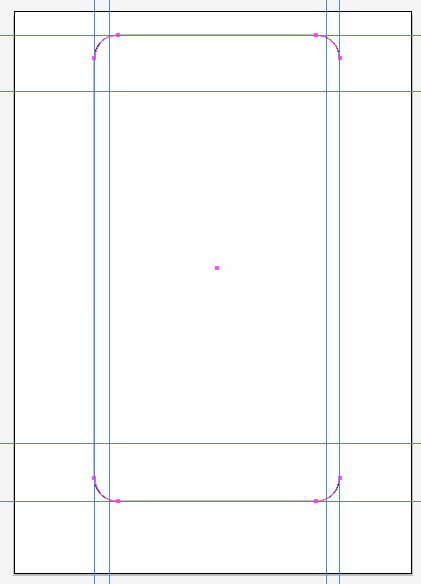 Draw the shape of a phone’s receiver inside the first rectangle using the Pen tool. 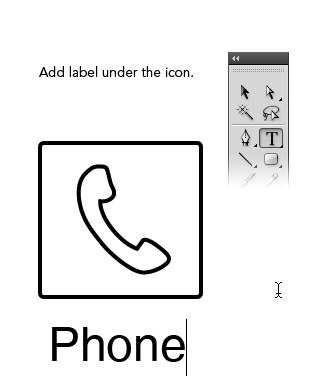 Use Type and add the label under the icon. 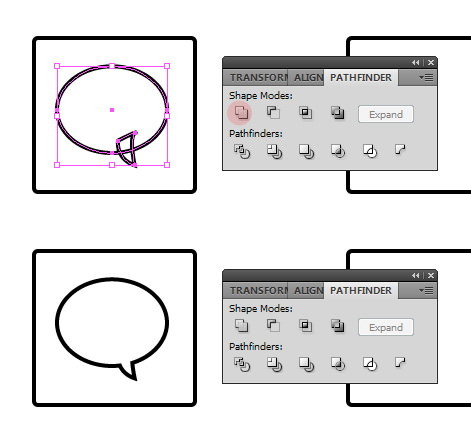 Inside the next rounded rectangle, draw an avatar icon. 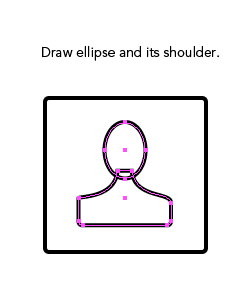 Draw an ellipse for its head and manually draw its shoulder. 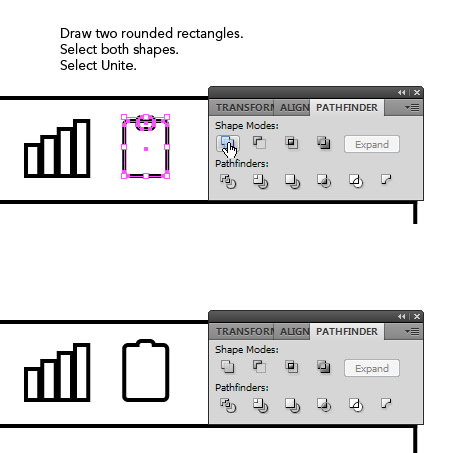 Select both shapes and click Unite on the Pathfinder tool. In the next rounded rectangle draw an ellipse and a comma shape. Select both shapes and click Unite to turn it into a balloon callout. 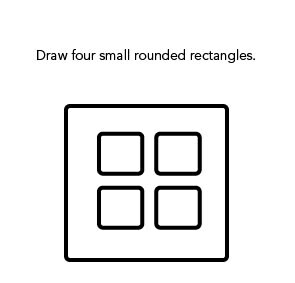 Inside the last rounded rectangle, draw four smaller rounded rectangles. Below are our completed icons! 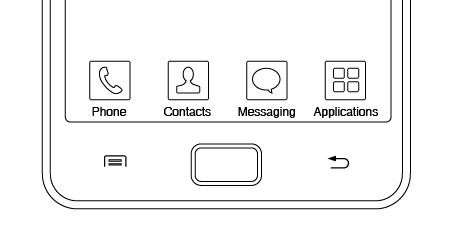 Above the icons, draw small circles. 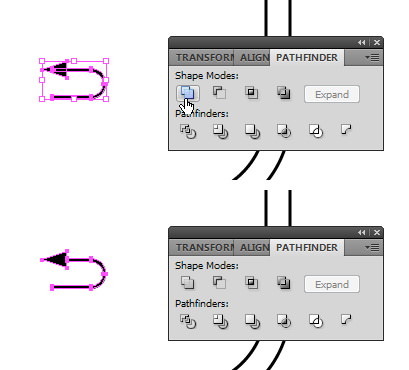 Alt + Shift + Drag the shape to duplicate it. 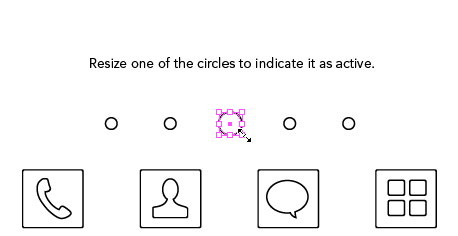 Select all the circles and click Horizontal Distribute Center inside the Align panel. Select one of the circles and resize it bigger. This bigger circle indicates that it is the ‘active’ page. 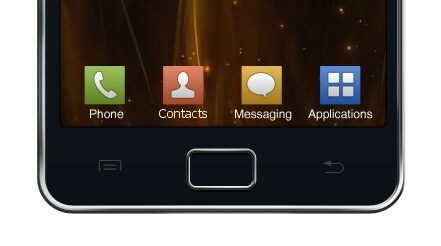 Inside the status bar on the upper part of the screen, draw a small rectangle and then duplicate it. 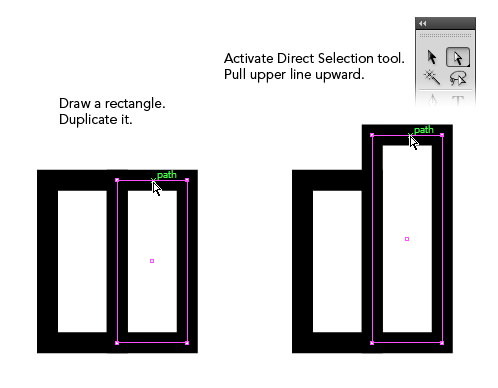 Drag the top line of the second rectangle upwards using Direct Selection tool. Repeat this process until we have four rectangles as shown below. 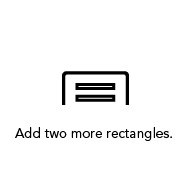 Draw two rounded rectangles. Select both shapes and then click Unite. 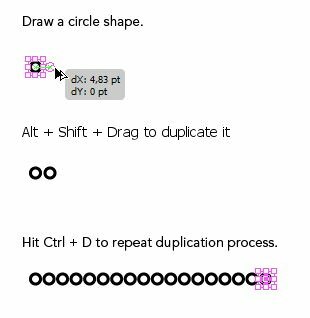 Draw a circle and Shift + Alt + Drag to duplicate it. Hit Ctrl + D a few times to repeat this duplication process. 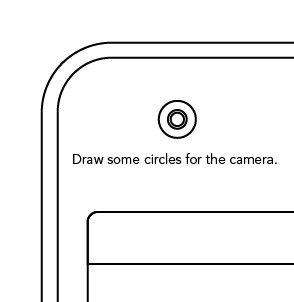 Draw a big rounded rectangle covering the small circles. The "camera" is simply made from some circles with different sizes with the same origin. 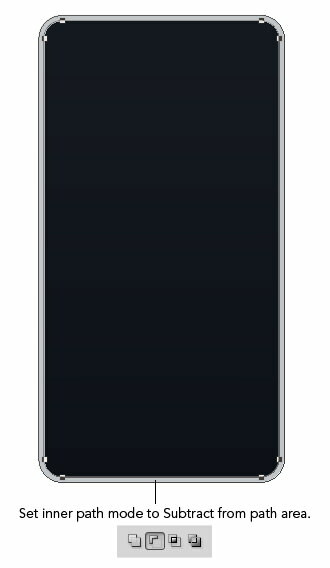 Draw two rounded rectangles on both sides of the phone as shown. 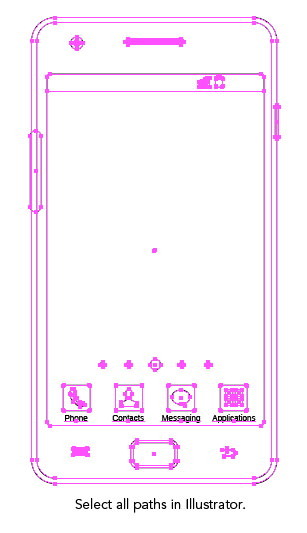 We have finished working on the phone wireframe. It’s time to bring it to life using Photoshop. Open up Photoshop and then make a new file, File > New. 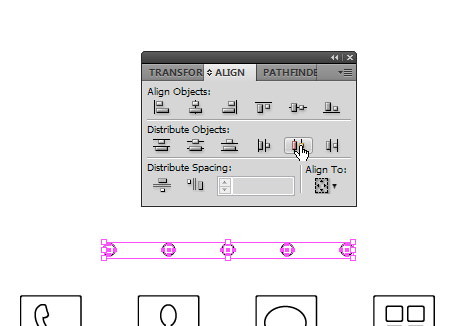 Select all paths in Illustrator (Ctrl + A) and then save it to Clipboard (Ctrl + C). Return to Photoshop and then paste it (Ctrl + V). In the option dialog box select Path. The vector path will be kept in a new path inside the Paths panel. Copy the basic shape path into a new path. 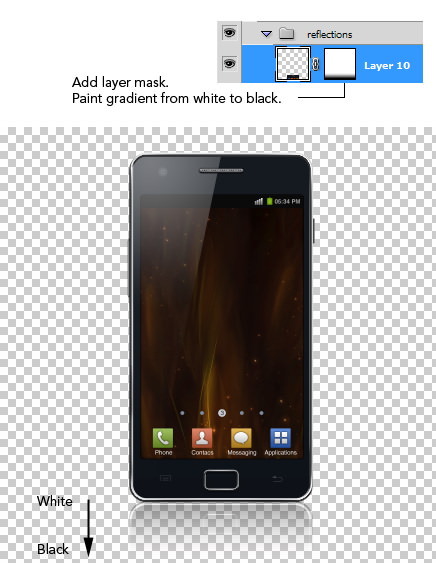 Click white and black circle in the Layers panel to add a new Adjustment Layer. 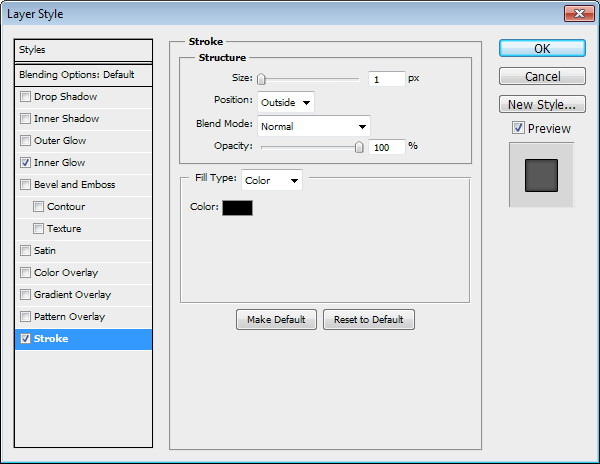 Select Solid Color and set color to #0f1219 in the next dialog box. Add Gradient Overlay to add subtle lighting onto the shape. Duplicate the shape we have just created and double click its thumbnail layer to change its color to #c3c6c9. 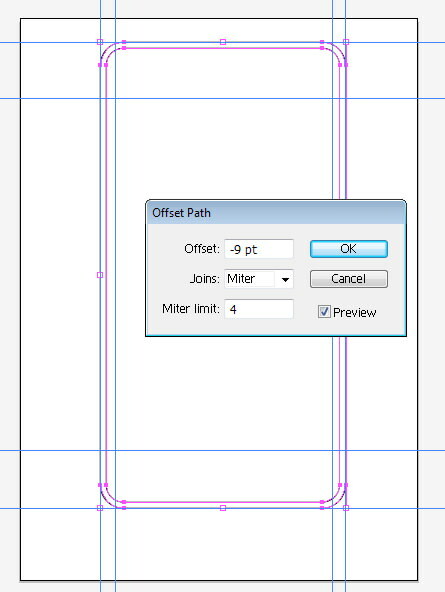 From the option bar, set inner path mode to Subtract from path area. This will turn the shape into the phone edge. Add Bevel and Emboss to convert shape into a three-dimentional shape. Make a new layer. 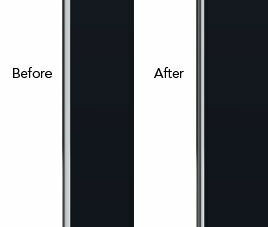 Convert layer to Clipping Mask by pressing Ctrl + Alt + G. From now on, everything you paint will go inside the phone edge. Activate Brush tool and set foreground color to black. Paint subtle shadows on parts of the phone edges. 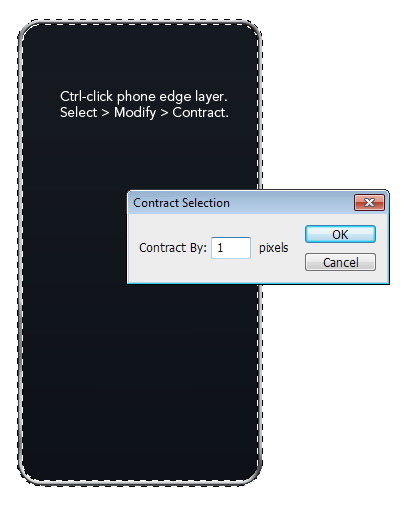 Ctrl-click the phone edge layer to make a new selection based on its shape. Click Select > Modify > Contract by 1 px. By doing this you are making the selection smaller by 1 px. Make a new layer and paint other subtle shadows and highlights. 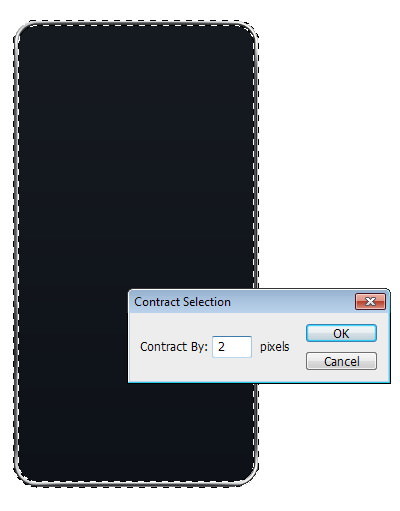 Repeat the previous step, this time use Contract by 2 px. Draw shadows and highlights on the phone edges. Below is the difference before and after adding highlights and shadows onto the edge. We can see that the result is more realistic. 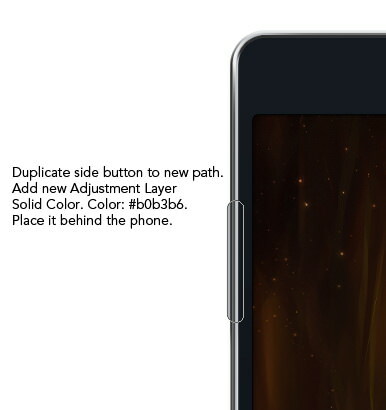 Duplicate the screen area onto a new path. Click Add a New Adjustment Layer and select Solid Color. You can use any color. Double click the layer to open a Layer Style dialog box. Add Inner Glow and Stroke. Let’s insert a wallpaper into the screen. 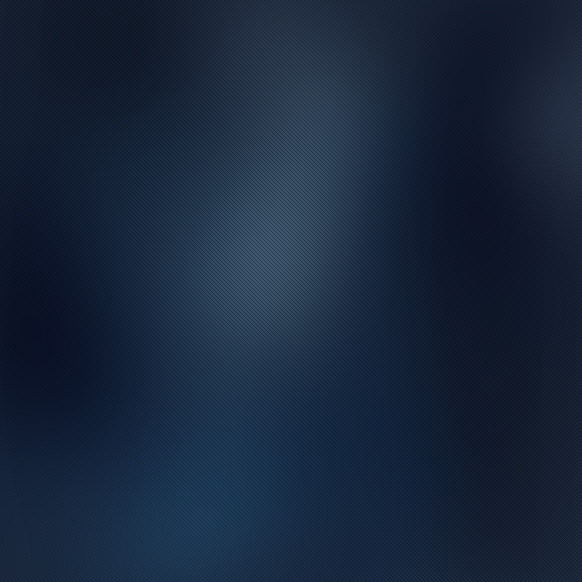 Drop a wallpaper picture right on top of the screen area layer. Here, I use a nice nebula image. Hit Ctrl + Alt + G to convert it into a Clipping Mask. 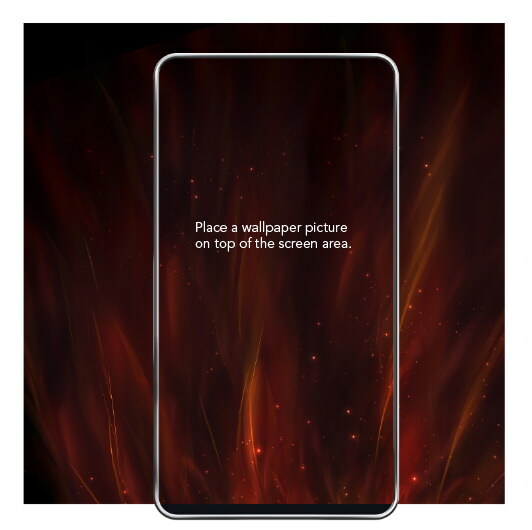 The wallpaper will automatically go inside the screen. Click icon black and white circle in the Layers panel to add a new Adjustment Layer. 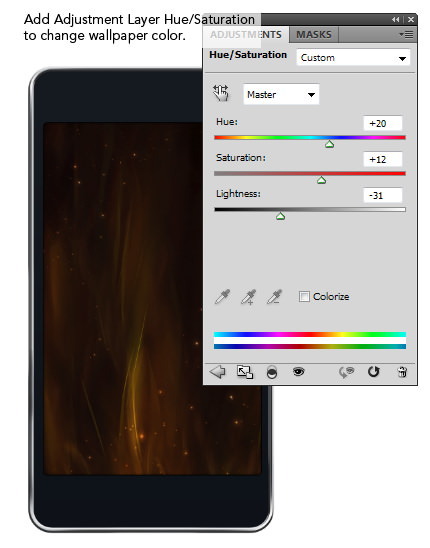 Select Hue/Saturation from the menu and use the slider to modify the wallpaper color. 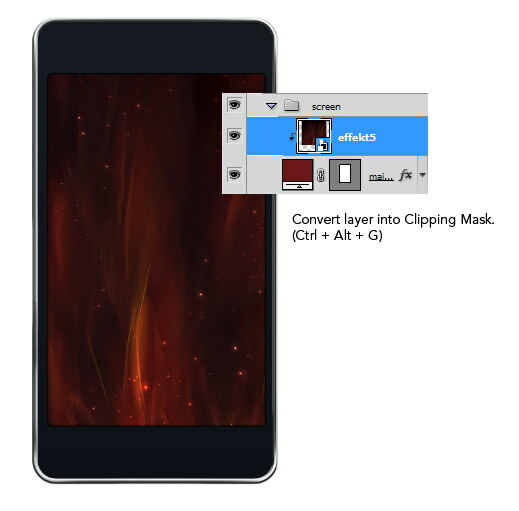 Set it to Clipping Mask again by hitting Ctrl + Alt + G. This way, the adjustment layer will only affect the wallpaper and not the phone. 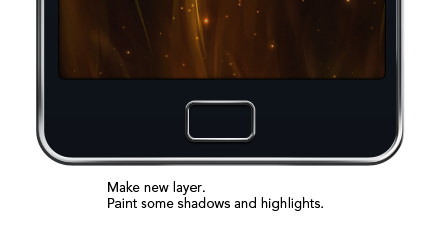 Below is how your layer appearance should be. Duplicate the main button onto a new path. 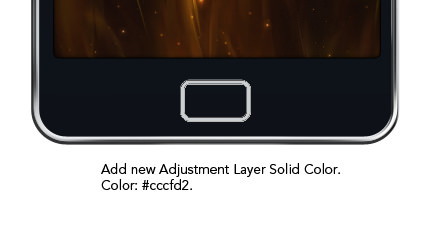 Add Adjustment Layer Solid Color with the color #cccfd2. Double click the layer and activate Drop Shadow and Bevel and Emboss. Let’s paint highlights and shadows onto the button. 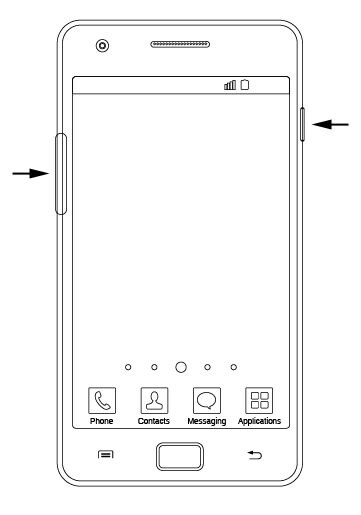 The process is very similar to what we did with the phone edge in Step 48 to Step 51. Ctrl-click the main button layer to make a new selection based on its shape. Click Select > Modify > Contract by 1 px. Make a new layer. Paint subtle highlights and shadows onto the buttons. Select the other two buttons and duplicate them onto a new path. Add a new Adjustment Layer Solid Color with white as its color. 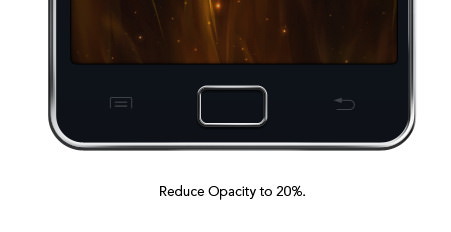 Bring down its Opacity to 20%. 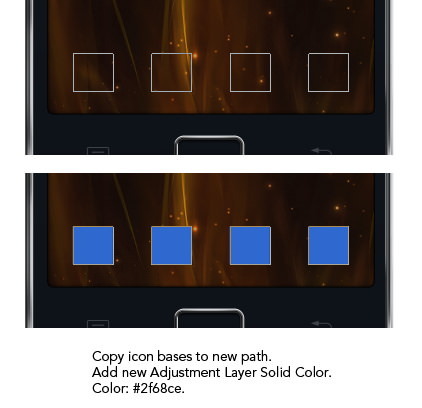 Copy icon bases onto a new path. Make a new Adjustment Layer Solid Color. Set its color to blue. Double click layer and add subtle Gradient Overlay. Delete the other three shapes. Repeat previous process for the other colors. 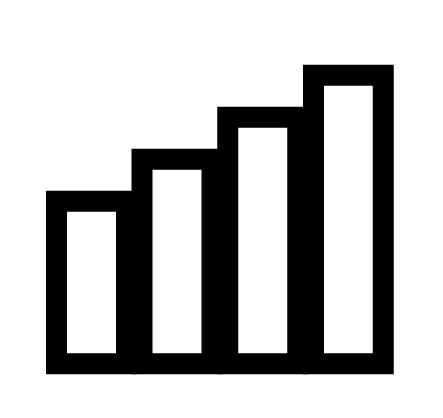 Duplicate icon shapes onto a new path. 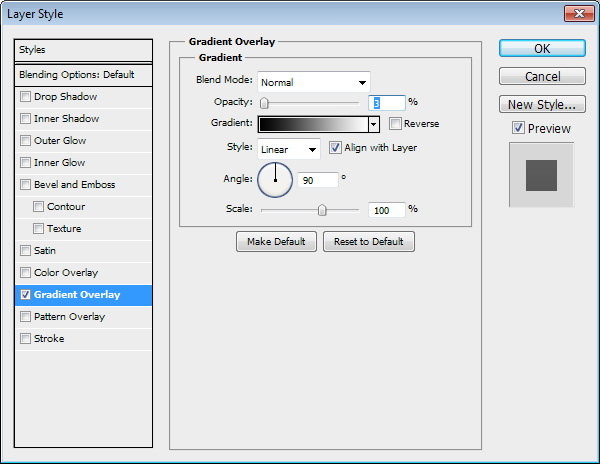 Add a new Adjustment Layer Solid Color. Set its color to white. 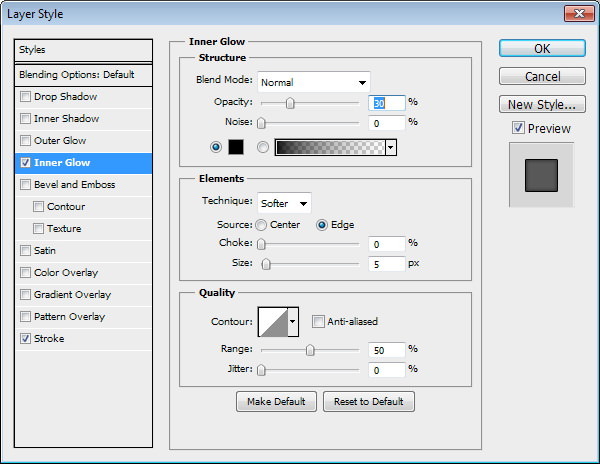 Double click the icon layer and activate Outer Glow and Gradient Overlay. Add an appropriate label under each icon. Select four small navigation circles and copy them to a new path. Add a new Adjustment Layer Solid with color #7e899b2d. Repeat the same process with a bigger ‘active tab’ in the center, this time with the color #cbced4. 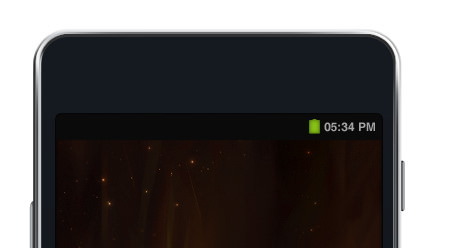 Add a number on top of the activate tab. I chose 3 for mine. 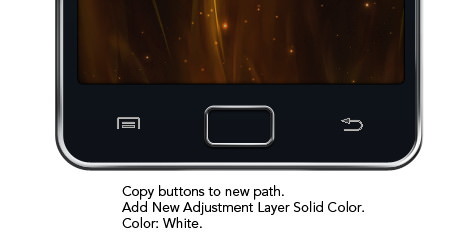 Duplicate side button to a new path. 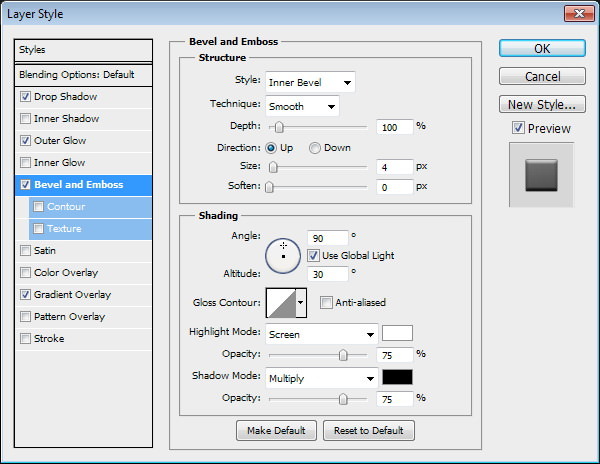 Make a new Adjustment Layer Solid Color with color #b0b3b6. Place it behind the phone. Add Inner Shadow with Angle 0 degree and Inner Glow. Repeat the process for the other button. 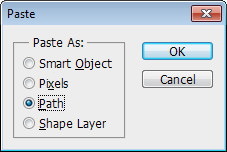 Double click Layer button to open Layer Style dialog box. 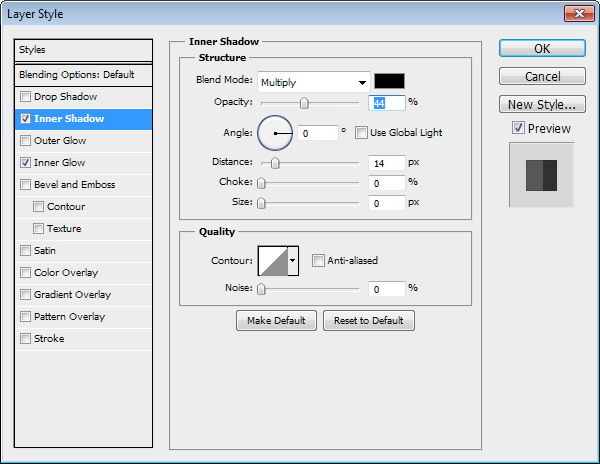 Add Inner Shadow but this time use 180 degree to add a shadow onto the button. Also, add Inner Glow. 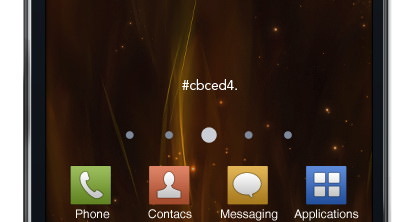 Select status bar and duplicate it onto a new path. Make new Adjustment Layer Solid Color with black as its color. 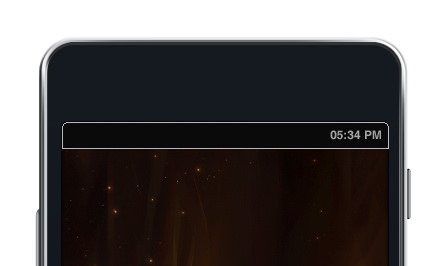 Add time information. 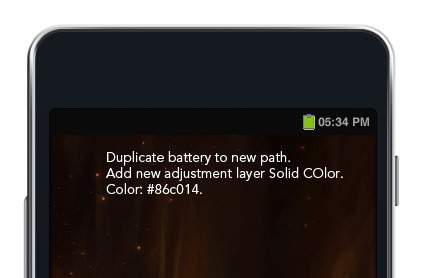 Duplicate the battery to a new path. Add a new Adjustment Layer Solid Color. Select green as its color. 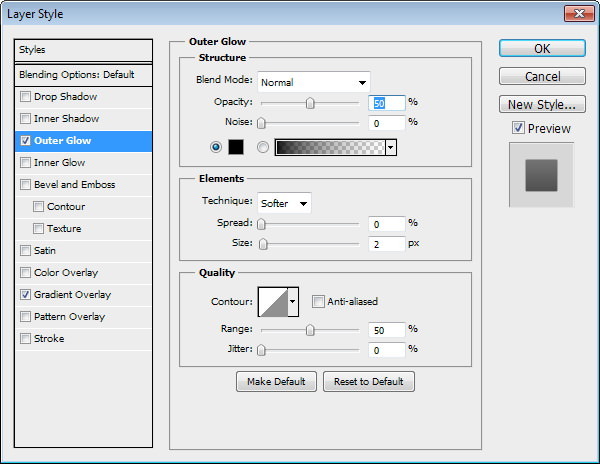 Add Inner Glow with the following settings. 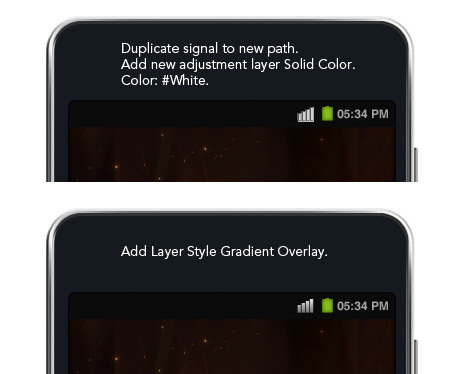 Duplicate the signal icon to a new path and add Adjustment Layer Solid Color. For its color select white. Double click Layer and activate Gradient Overlay. Duplicate the speaker onto a new path. From the option bar, set a smaller circle path mode to Subtract from the path area. Add a new Adjustment Layer Solid Color with #6b6f76 as its color. Double click Layer and add the following Layer Styles. Activate the circle and duplicate it to a new path. 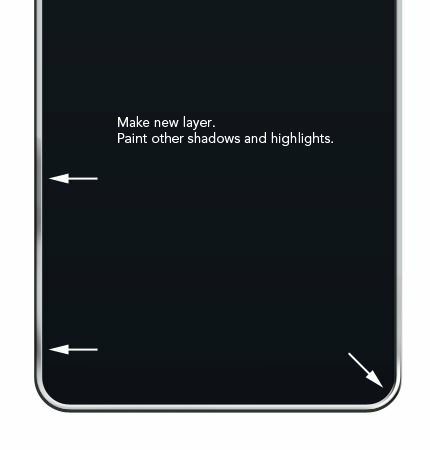 Add a new Adjustment Layer with the color #272d36. 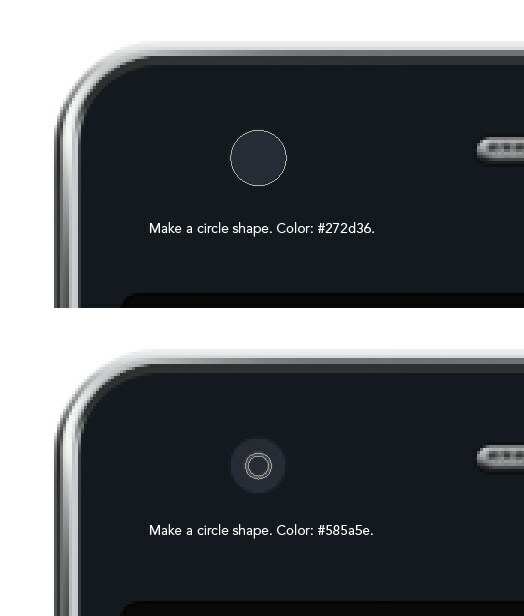 Do the same with the ring inside the circle but with the color #585a5e. Below is the camera in 100% magnification. 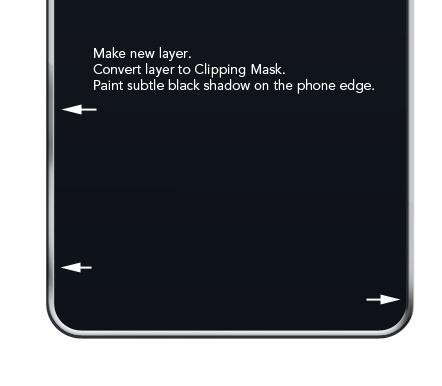 Duplicate the basic phone shape onto a new layer. 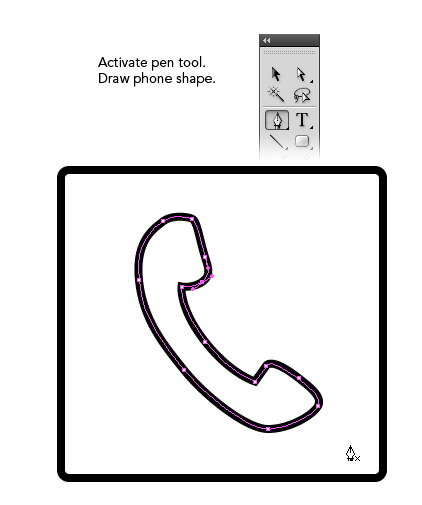 Draw a polygonal shape cutting across the phone and set its mode to Intersect path area. Add a new Adjustment Layer Solid Color, set white as its color. Double click the reflection shape and add subtle Gradient Overlay. 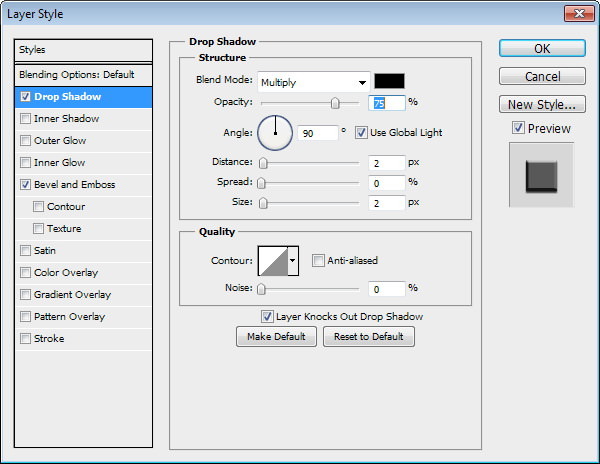 Set Blend mode to Screen and reduce its Opacity to 70% and Fill to 0%. Ctrl-click reflection layer. Make a new layer and paint more highlight on its upper area. 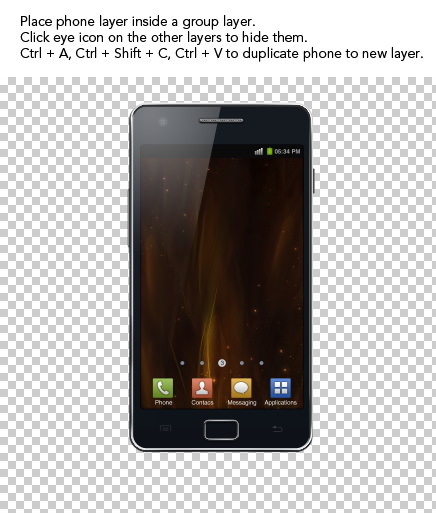 Place the phone layers inside a group by selecting all of them and hit Ctrl + G. Click the eye icon on background to hide them and make the phone sit on a transparent background. Hit Ctrl + A, Ctrl + Shift + C, Ctrl + V to duplicate phone to a new layer. Hit Ctrl + T to transform the phone. Right click and chose Flip Vertical. Put the phone under the original phone. Add a layer mask and paint a gradient from white to black to fade the reflection. 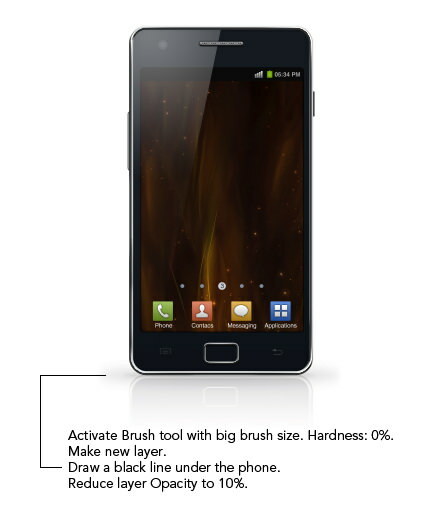 Activate the Brush tool with big brush size and Hardness 0%. 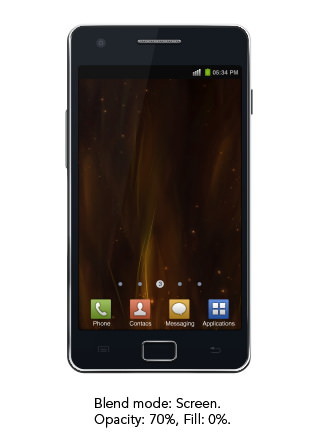 Make a new layer and draw a black line under the phone. Set its Opacity to 10%. Let’s work on the background. Make a new layer and start painting using different shades of blue. There’s no perfect rule here. Unleash your creativity. 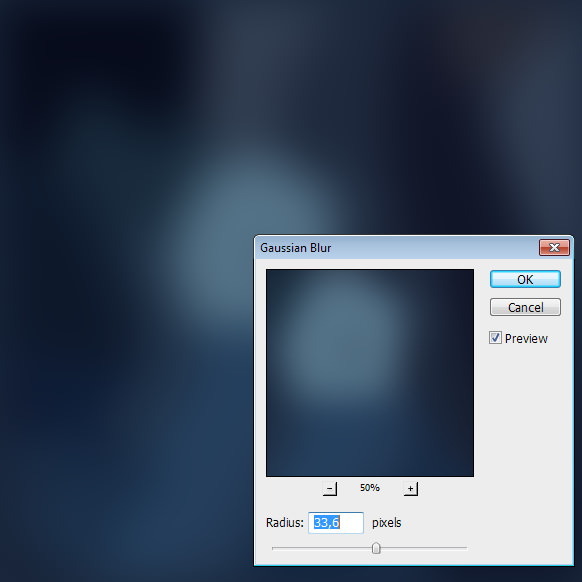 Add Gaussian Blur (Filter > Blur > Gaussian Blur). Use very big radius sizes and make sure to activate Preview options so you can see the result in real time. Let’s make a pixel pattern (or, you can skip these steps and use an already made pixel pattern from PSDfreemium). Make a new file with size 6 ÃÂÃ¢ÂÂ 6 pixels. Hit Ctrl + 0 to maximize the canvas magnification level. 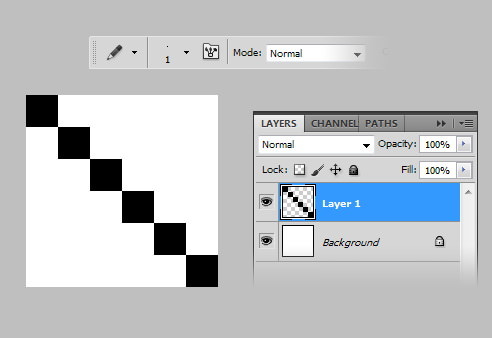 Make a new layer and draw a diagonal line using the Pencil tool with 1 px brush size. Hide Background so we only see the diagonal line. 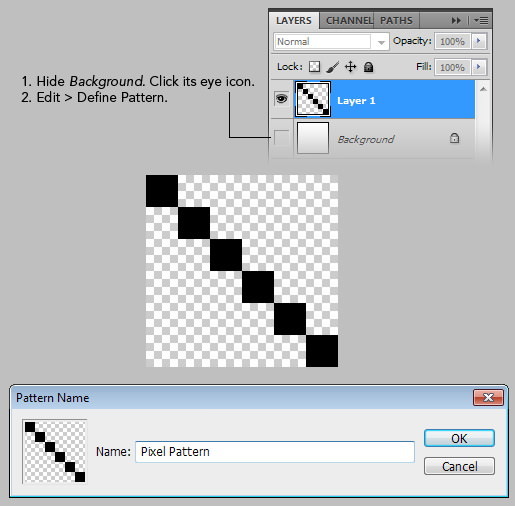 Click Edit > Define Pattern to save the image as a pattern. 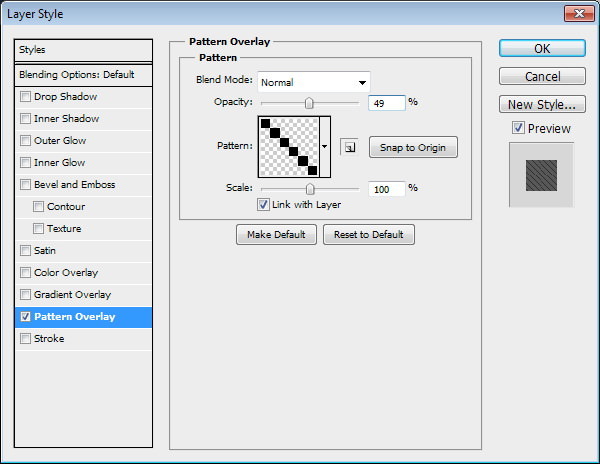 Return to our background, double click it and add Pattern Overlay using the pattern we have just made earlier. Finally, we can bring back our phone. As you can see, we have just combined the flexibility of vector drawing in Illustrator, and the ease of pixel painting in Photoshop to achieve a realistic product image. I hope you enjoyed this tutorial. Click here to download the final PSD for this tutorial.